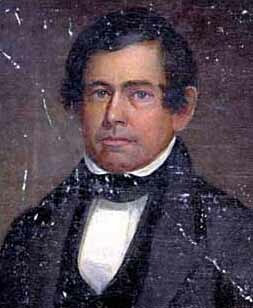 Thomas Corwin was an Ohio governor and prominent U.S. political leader in the years before the American Civil War. Corwin was born in Bourbon County, Kentucky, on July 29, 1794. The Corwin family moved to Lebanon, Ohio, in 1798, where Thomas Corwin's father, Mathias, was later elected to eleven consecutive terms as a state representative. As a result, Corwin grew up with an interest in politics and law. As a young man, Corwin studied law and he was admitted to the Ohio bar in 1817. He practiced law in Lebanon and soon became prosecuting attorney of Warren County. He held that position he from 1818 to 1828. In addition to his law practice, Corwin also soon became involved in politics. Warren County residents elected him to the Ohio House of Representatives from 1821 to 1823 and again from 1829 to 1830. In the meantime, he married Sarah Ross, originally from Chester County, Pennsylvania, on November 13, 1822. They had five children. Corwin became associated with the Whig Party in the 1830s and he was elected to five straight terms in the United States House of Representatives during that decade. He earned a nickname of "the terror of the house" because of his reputation for spirited and witty debate in the House of Representatives. Corwin resigned from Congress in 1840 to run for governor of Ohio. Corwin defeated incumbent Wilson Shannon, becoming Ohio's 15th governor. In addition to winning his own election, Corwin also contributed to William Henry Harrison's successful campaign for the presidency. He became well known by making many articulate speeches across the state of Ohio. In this way he earned a positive reputation, which he maintained the rest of his life. Although Corwin had won election, he found that his time as governor would not be easy. He and other Whigs wanted to create a state bank, but Democrats dominated both houses within the state legislature. They defeated his plans for the bank. Because the state was still in an economic downturn, Corwin and the Whig Party received much of the blame for not creating solutions. In the election of 1842, Wilson Shannon ran against Corwin and won. In 1844, the Whigs returned to power, and Corwin became a United States senator. As a senator, he opposed the Mexican-American War. This stand gained him national attention. Corwin served in the Senate from 1845 until July 20, 1850, when President Millard Fillmore appointed him Secretary of the Treasury. In 1853, Corwin retired from politics and returned to his law practice in Lebanon, Ohio. Corwin's retirement did not mean the end of his political career. By the 1850s, the Whig Party was coming apart because of internal disagreements about slavery. Corwin joined the new Republican Party and returned to Congress in 1859. Corwin campaigned vigorously for Abraham Lincoln in the presidential election of 1860, although he initially sought the Republican Party's presidential nomination for Ohioan John McLean. After Lincoln was elected, he appointed Corwin as Minister to Mexico, a post that he held from 1861 to 1864. Corwin was popular in Mexico. He helped the United States maintain a strong relationship with that nation throughout the Civil War, in part because of his earlier opposition to the Mexican-American War. Corwin retired to Washington, D.C., in 1864, where he practiced law until his death on December 18, 1865. Auer, J. Jeffrey. "Lincoln's Minister to Mexico." Ohio State Archaeological and Historical Quarterly 59 (1950): 115-128. Pendergraft, Daryl. "Thomas Corwin and the Conservative Republican Reaction, 1858-1861." Ohio State Archaeological and Historical Quarterly 57 (1948): 1-23. Carroll, Stephen Graham. Thomas Corwin and the Agonies of the Whig Party. Boulder: University of Colorado Press, 1970. Corwin, Thomas, (1794 - 1865). Biographical Directory of the United States Congress. Http://bioguide.congress.gov/scripts/biodisplay.pl?index=C000791.